The latest 13F reporting period has come and gone, and Insider Monkey is again at the forefront when it comes to making use of this gold mine of data. We have processed the filings of the more than 700 world-class investment firms that we track and now have access to the collective wisdom contained in these filings, which are based on their December 31 holdings, data that is available nowhere else. Should you consider Arconic Inc. (NYSE:ARNC) for your portfolio? We’ll look to this invaluable collective wisdom for the answer. Is Arconic Inc. (NYSE:ARNC) a superb investment now? Money managers are in an optimistic mood. The number of long hedge fund positions rose by 6 recently. Our calculations also showed that ARNC isn’t among the 30 most popular stocks among hedge funds. If you’d ask most traders, hedge funds are seen as unimportant, outdated financial vehicles of the past. While there are over 8000 funds in operation at the moment, Our experts hone in on the leaders of this group, about 750 funds. These investment experts have their hands on bulk of the smart money’s total capital, and by monitoring their matchless stock picks, Insider Monkey has figured out several investment strategies that have historically outrun the broader indices. Insider Monkey’s flagship hedge fund strategy beat the S&P 500 index by nearly 5 percentage points a year since its inception in May 2014 through early November 2018. We were able to generate large returns even by identifying short candidates. Our portfolio of short stocks lost 27.5% since February 2017 (through March 12th) even though the market was up nearly 25% during the same period. We just shared a list of 6 short targets in our latest quarterly update and they are already down an average of 6% in less than a month. Let’s take a gander at the fresh hedge fund action surrounding Arconic Inc. (NYSE:ARNC). How have hedgies been trading Arconic Inc. (NYSE:ARNC)? At Q4’s end, a total of 46 of the hedge funds tracked by Insider Monkey were long this stock, a change of 15% from the second quarter of 2018. 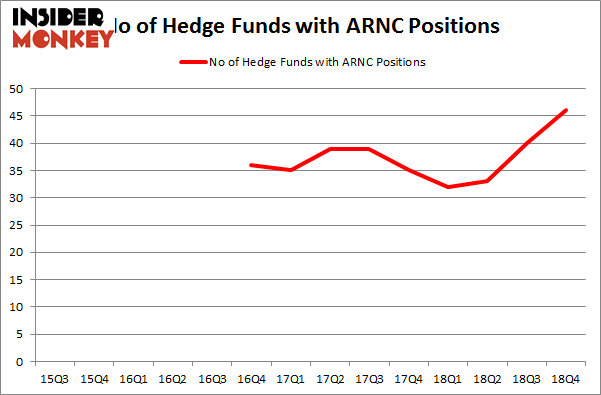 The graph below displays the number of hedge funds with bullish position in ARNC over the last 14 quarters. So, let’s find out which hedge funds were among the top holders of the stock and which hedge funds were making big moves. More specifically, Elliott Management was the largest shareholder of Arconic Inc. (NYSE:ARNC), with a stake worth $875.1 million reported as of the end of September. 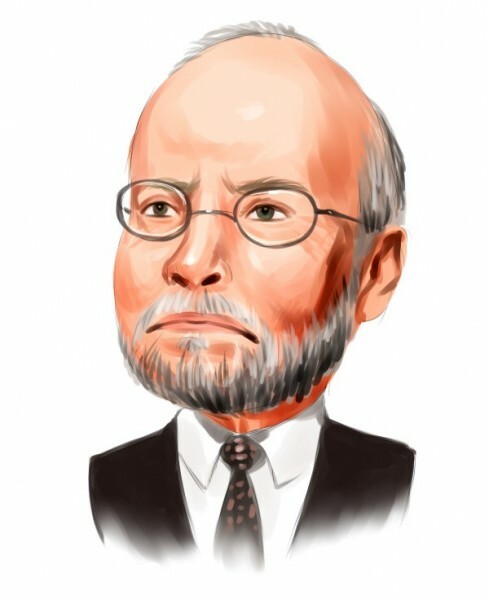 Trailing Elliott Management was Orbis Investment Management, which amassed a stake valued at $479.9 million. First Pacific Advisors LLC, Canyon Capital Advisors, and Kensico Capital were also very fond of the stock, giving the stock large weights in their portfolios. Consequently, key money managers were leading the bulls’ herd. Alyeska Investment Group, managed by Anand Parekh, initiated the most valuable position in Arconic Inc. (NYSE:ARNC). Alyeska Investment Group had $4.2 million invested in the company at the end of the quarter. Himanshu Gulati’s Antara Capital also made a $3.9 million investment in the stock during the quarter. The following funds were also among the new ARNC investors: David Rosen’s Rubric Capital Management, John Orrico’s Water Island Capital, and Himanshu Gulati’s Antara Capital. Let’s now take a look at hedge fund activity in other stocks similar to Arconic Inc. (NYSE:ARNC). We will take a look at Wayfair Inc (NYSE:W), LINE Corporation (NYSE:LN), Snap-on Incorporated (NYSE:SNA), and American Financial Group (NYSE:AFG). This group of stocks’ market valuations are closest to ARNC’s market valuation. As you can see these stocks had an average of 21.5 hedge funds with bullish positions and the average amount invested in these stocks was $569 million. That figure was $2480 million in ARNC’s case. American Financial Group (NYSE:AFG) is the most popular stock in this table. On the other hand LINE Corporation (NYSE:LN) is the least popular one with only 4 bullish hedge fund positions. Compared to these stocks Arconic Inc. (NYSE:ARNC) is more popular among hedge funds. Considering that hedge funds are fond of this stock in relation to its market cap peers, it may be a good idea to analyze it in detail and potentially include it in your portfolio. Our calculations showed that the top 15 most popular stocks among hedge funds returned 21.3% through April 8th and outperformed the S&P 500 ETF (SPY) by more than 5 percentage points. Hedge funds were also right about betting on ARNC, though not to the same extent, as the stock returned 20.6% and outperformed the market as well.